Dixie Castle, Jackson TN – Marie, Let's Eat! 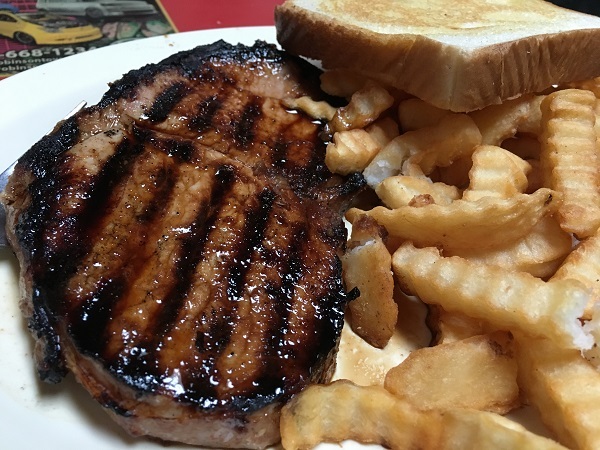 We were not sure what to expect when we visited the downtown location of this small eighty year-old chain of diners, but we found an incredibly popular place which serves an amazingly good dinner. Well, I’m willing to wager the good gentleman was mistaken. If he lives around Jackson, he knows at least one person who eats at the Dixie Castle, because everybody other than him eats here. The downtown location – I believe that there are currently three – opens at five for dinner. We arrived about ten to six, hoping to get ahead of the rush. The place was packed and we had to wait. Our hostess told me there’s always a line already formed when they open. The first Dixie Castle opened in 1937. As you can see from the photo up top, the original Dixie Castles were imitations of some other chain with a Castle in its name, along with all the Blue Circles, White Towers, Krystals and the like that were popular nickel hamburger joints in the thirties and forties. The photo seems to be of the third in the chain, and it served hot tamales and minute steaks as well. 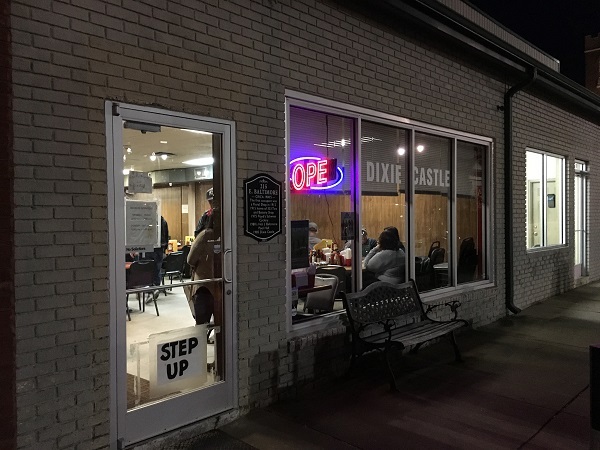 Over time, the Dixie Castle “grew up” alongside its customer base, in much the same way that Wally’s Drive-In here in Chattanooga transitioned from a place to get fast junk food and ice cream at the curbside into a full-service family restaurant. This location opened in 1985 in a downtown building that dates back to 1912 and was, at various times, a tire shop, a florist, and a pool hall called Hot L Baltimore. This might be the only pool hall in history to have the same name as a Norman Lear sitcom. 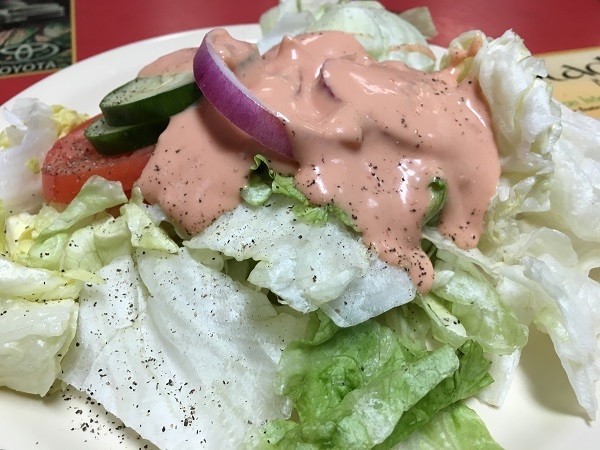 The Dixie Castle’s evening menu is fairly limited, with just about twelve selections, and salads of iceberg lettuce and a homemade Thousand Island dressing accompany just about everything. Well, I suppose there are other dressings, but who needs those, I ask you? Our server recommended the steak and the pork chop, so we had those and split them, while our son had some chicken tenders. Holy moly. You might not believe me – I am somewhat guilty of hyperbole – but that was a pretty good steak and a downright amazing pork chop. That was completely and absolutely delicious. I don’t know that I’ve ever had a better one. Period. The service was remarkably attentive for a restaurant so incredibly busy, but it cleared out quite early as well. In Jackson, the dinner rush doesn’t obey the same rules as in other towns. If we had come by at 6:45, I’d still rave about that pork chop, but I’d worry that the restaurant was living on borrowed time. Then again, Jackson is a small city, with a downtown that gets quiet in the evening. We walked a few blocks after our meal, and the only businesses that we saw that were still open after seven were the Greyhound station and the Rock-a-Billy Hall of Fame, which was only open because they were having country line dancing that night. Even the “luxury loft apartments” on Main and Liberty didn’t have a single light in any of the windows. Perhaps people fill the Dixie Castle after finishing their five o’clock shifts and head to the suburbs. They’re heading home after a terrific meal if that’s the case. 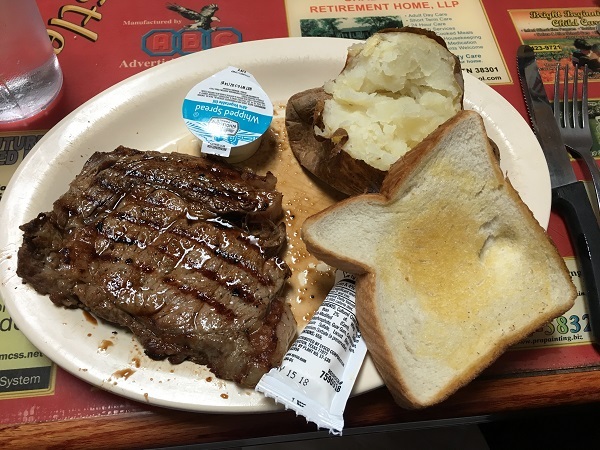 Posted on March 19, 2018 March 19, 2018 by Grant G.Posted in jackson, tennesseeTagged diner, jackson, pork chop, steak, tennessee.